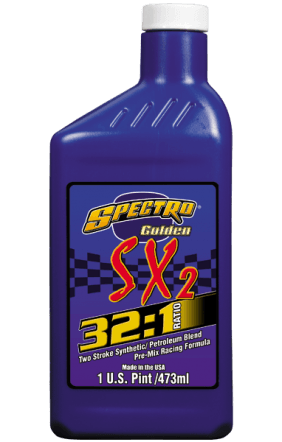 Golden SX2 32:1 synthetic blend pre-mix is a super-premium two-cycle engine lubricant formulated for today’s two-cycle moto-cross motorcycles equipped with exhaust power valves specifying a 32:1 pre-mixed fuel-to-oil mixture. Synthetic base stocks replace the high-density bright stock used in most lubricants — thereby reducing smoke and carbon residue considerably when mixed at the specified 32:1 ratio. A recent breakthrough in additive technology also provides exceptional ring groove and power valve cleanliness. Meets manufacturers’ warranty requirements and exceeds JASO FC, ISO-L-EGD + and API TC test requirements.